Feminists in tech have been staging attempted “honey traps” to frame prominent male software developers for sexual assault, according to explosive claims on the blog of Eric S. Raymond, a pioneer of the open source movement. In allegations that will rock the world of software development, prominent targets included Linus Torvalds, creator of the Linux kernel. Raymond quoted excerpts from an online chat with a trusted source, who told him that the Ada Inititiative, a recently-discontinued feminist advocacy group in tech, was trying to “collect scalps” by concocting charges of attempted sexual assault against male software developers. The source told Raymond that the “MO” of the feminists was to “get alone with the target, and then immediately report attempted sexual assault.” The source said he had stopped mentoring female developers over fears that they might fabricate such charges. Raymond, who is a renowned figure in the open source community, strongly vouched for the trustworthiness of his source, telling readers that he had been “well-informed and completely trustworthy in the past. He added that another “regular” on his blog had also been present for the conversation. Raymond’s blog post, which can be read in full here, goes on to recommend an attitude of “collective guilt” and “scepticism” towards the claims of feminists in tech. ‘They have made multiple runs at him.’ Just let the implications of that sink in for a bit. If my source is to be believed (and I have found him both well-informed and completely trustworthy in the past) this was not a series of misunderstandings, it was a deliberately planned and persistent campaign to frame Linus and feed him to an outrage mob. 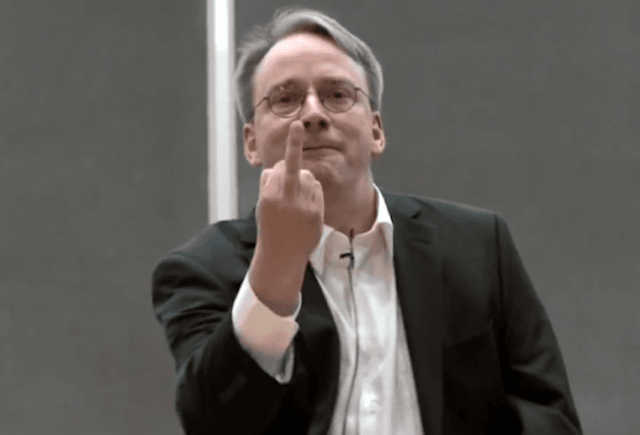 Linus hasn’t spoken out about this; I can think of several plausible and good reasons for that. And the Ada Initiative shut down earlier this year. Nevertheless, this report is consistent with reports of SJW dezinformatsiya tactics from elsewhere and I think it would be safest to assume that they are being replicated by other women-in-tech groups. I’m going to take my source’s implied advice. And view ‘sexual assault’ claims fitting this MO with extreme skepticism in the future. If true, these claims will rock the world of software development, not to mention the wider tech community, which is suffering under the yoke of diversity campaigners levelling bogus charges of sexism at companies and individuals and pestering companies to improve their diversity credentials. The claims of Raymond’s source could also provide an explanation for why so many tech diversity activists, such as the innovation expert Vivek Wadhwa, and the Puerto Rican software developer Roberto Rosario, have been mercilessly set upon by tech feminists. If feminists are trying to frame software developers for sexual assault, it would be important for them to occupy the chief positions in the “diversity movement” to ensure the incidents were followed by sufficient outrage across the movement. Prominent diversity activists who are not subscribed so such nefarious methods could therefore present a problem. Despite widespread discussion in the industry of the explosive claims on Raymond’s blog, and the stature of Raymond within software development, other tech news outlets – normally champing at the bit to report on diversity issues – have so far been curiously silent on this story. Breitbart Tech is, thus far, the exception.